wine-pages resource files are written by visitors to wine-pages.com who know and love the cities and places featured. These are the personal views of people who have discovered for themselves the best of food, wine and things to do in each city or region. 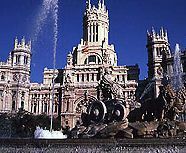 My thanks go to Dawn Bliss and Andy Wilson for compiling this address file for Madrid.For general Madrid information I highly recommend Softguide Madrid, a free and very comprehensive online city guide. The international dialling code for Spain is +34. Dawn Bliss: Please note most of the formal restaurants do not open for dinner until at least 9pm and even if you go then, you are likely to be the only folks in the place until 10pm or so. A cool happening spot for “pre-dinner cocktails” is the lounge in the Hotel Ritz, Plaza de la Lealtad, 5 (Tel: 91 701 67 67). We were fortunate to get a deal on the web and were staying there. The atmosphere is fab – very high ceilings, thick plush chairs, massive chandeliers, with a soft piano playing in the background. A great place to people watch over a glass of Muga rioja before heading out on the town. And they also do proper afternoon tea. (The little cafe next door to the Ritz was also a very good stop for the standard Madrileno breakfast of reasonably priced fresh OJ, churros, toast and coffee along with the office workers). Tapas bars – I particularly liked the tapas bars in and around the Plaza Santa Ana/Cava Baja/Opera areas. The Plaza Mayor area also has a lot of bars but is very touristy. Some of my favourite nibbles are champinones (garlicky mushrooms), gambas a la plancha (grilled prawns), patatas bravas (spicy potatoes) and manchego cheese. However the choice for carnivores is much wider with a huge choice of hams, morcillo (black pudding), spicy sausages etc. Wine is extremely well priced by the glass and incredibly good quality compared to the crap you normally get served up in a pub in the UK. For something more substantial, more upmarket and great food/friendly atmosphere, I enjoyed El Olivo, c/General Gallegos (tel: 91 359 15 35). This is actually owned by a Frenchman and specialises, as the name might suggest in olives/sherry and oil. It was wild mushroom season when we visited so we had a lovely sampler plate of 4 different dishes featuring fungi. El Olivo does a tasting menu too. The wine prices, as in most Spanish restaurants I have visited, are extremely keen with some just fractionally over or even under retail. We also went to Paradis, c/Marques de Cubas 14 (Tel: 91 429 73 03), which was also fairly upmarket but my other half’s meal seriously disagreed with him and I did not think the food or atmosphere were a patch on El Olivo. The “top” restaurant is allegedly Zalacain, c/Alvarez de Baena, which is expensive but as there is a jacket and tie dress code we stayed clear. Our chums also recommended the restaurant in the Ritz which seems to be rated highly by the various guide books too. Andy Wilson: I was recently in Madrid and had a wonderful time. I found it to be a wine lovers paradise. As long as you stick to the traditional Spanish bars you will find the standard of wine excellent. A bottle of of good Rioja Reserva could be had for £6. You must try the tapas which is generally served in most bars. My favourites were Boquerones (small anchovy like fish), Patatas alioli (Potatoes in garlic mayonnaise)and jamon serrano (cured ham). There are many, many more to choose from. We generally found the best bars to be around the Plaza de Santa Ana. For a bar that is slightly different I would suggest the Naturbier on Plaza de Santa Ana 9 (Tel: 91 429 39 18). It brews its own slightly cloudy but wonderful beer on the premises. Dawn Bliss: Best wine shop was Lavinia, c/ Jose Ortega y Gasset, (Tel: 91 426 06 04). With the biggest selection by far – including a cave of some cracking verticals including Mouton, Vega etc – this looks like a really smart hi-tech bar from the outside. Inside it had a truly stunning, extensive selection from all over Spain/rest of the world – and is probably one of the largest wine shops I have ever been in. We were ably assisted and advised by Eduardo dos Santos, originally from Brazil, who has also spent a lot of time in London so if you want some top tips ask him. In fact, all of the staff were extremely helpful and even trucked our (numerous) purchases back to the hotel to save us lugging them. Within the ABC Serrano shopping complex round the corner from Marks and Spencer on c/Serrano 52 is another nice store, La Bodega del Alcalde (Tel: 91 575 19 16), with a good selection (some of which I thought to be pretty expensive) it also has a food store at the front with fresh coffee, white asparagus etc. It’s also worth nipping into the Corte Ingles dept store – aside from being a great shop, some of the larger stores have fine food and wine sections “Gourmet Seleccion” and there is a large Corte Ingles relatively close to Lavinia (by taxi). Andy Wilson: I found a wonderful wine shop called Mariano Madrueno. Its on Calle Echegary. Its a old fashioned shop with a fantastic selection of wines including Rioja’s going back to the 60s and an amazing selection of sherries. Dawn Bliss: The museums are all pretty close to each other. The Prado (Paseo del Prado) is free on a Sunday after 2pm. Philistine that I am, I much preferred the modern art of the Museo Nacional Centro de Arte Reina Sofia (Santa Isabel, 52), which also has a nice gift shop and a slighly tatty cafe in the basement, and my other half, the Thyssen Museum (Paseo del Prado, 8) which has a bit of everything and a smart, modern little cafe. Taxis are relatively cheap and a great way to get around. Madrid also has a very good underground system. Beware of pickpockets. Madrid is rife with them, and watch out for groups of kids or gypsies who knock into you and then try and nick your wallet. I would not carry a lot of money or wear smart jewellery when walking around town. I thought the Sol area was a bit tacky and some strange people were wandering around – this, and parts of the Latin quarter, were the only parts of the city in which I felt slightly uncomfortable.